Ceredigion Council yesterday agreed not to close Bodlondeb residential home in Aberystwyth. The decision was taken at a closed Budget Workshop. The meeting heard a range of options for finding the extra money required and, although a final decision was not taken on this, council officers agreed to go away and work on it. One option could be to increase Council Tax. Council Leader Keith Evans, an unapologetic fiscal conservative, made his unhappiness at the decision clear but accepted the overwhelming view from both sides of the Council that Bodlondeb should remain open in response to a sustained public campaign of support. The Council are due to put out a press statement later today. 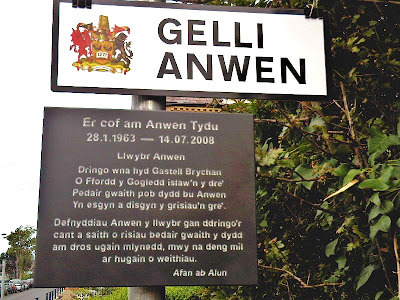 Former mayor of Aberystwyth Afan ab Alun today unveiled the new name for the 200 metre footpath leading from North Road in Aberystwyth up to Castell Brychan, the home of Cyngor Llyfrau Cymru, the Welsh Books Council. The footpath is named Gelli Anwen after his late wife Anwen Tydu. The plaque, funded by Aberystwyth Town Council, explains, in poetry and prose, how she used to climb and descend the 107 steps of the steep path four times a day over a period of twenty years, adding up to over thirty thousand passages. The occasion was filmed by the S4C TV programme Wedi 7. 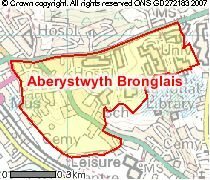 Ceredigion’s Council Cabinet today voted to defer any decision on closing Bodlondeb residential home in Aberystwyth until further meetings and discussions have been held. But the Cabinet was split after a proposal to abandon the plans altogether was defeated. A coach load of local residents had travelled down to Aberaeron to witness the debate on the Council’s Feasibility Report into plans for transferring residents at the Council-run Bodlondeb in Penparcau to the site of the privately-run Hafan y Waun at Waun Fawr on the other side of Aberystwyth. The split came when Council Leader Keith Evans proposed that the item be deferred until a Budgetary Workshop meeting involving the whole Council was held. This would discuss the proposals in the context of the overall council budget. However this proposal seemed to surprise some Cabinet members, who had already met for a ‘pre-Cabinet meeting’ earlier in the morning. Hag Harris, Cabinet Member for Social Services and therefore the councillor with the portfolio for the issue, proposed that plans to close Bodlondeb be abandoned altogether. The proposal was greeted by huge cheers and a standing ovation from the public gallery. He was supported by Ceredig Davies, Cabinet Member for Education, whose portfolio could be in the frame for providing some of the extra money needed to maintain Bodlondeb. However they were outvoted by other Cabinet members who all backed the Council Leader’s proposal to discuss the plans further. Those voting against the proposal to abandon the closure included Carl Williams, Lib Dem councillor for North ward in Aberystwyth, along with his Lib Dem colleague, Eurfyl Evans and the various Independents on the Cabinet. It was an emotional roller coaster for the dozens of people in the public gallery who momentarily thought their campaign to save Bodlondeb had succeeded following Hag Harris’s intervention. The sight of the Council Leader clashing publically with the responsible Cabinet Member, having first had the opportunity to agree a mutual stance at a preliminary meeting, is very unusual and it was clear there was annoyance on both sides. Councillors were later notified that the Budgetary Workshop to discuss the plans further will be held on the morning of Tuesday 26th July. It’s not yet clear if the public will be allowed to attend. Candidates have been declared for a Town Council by-election in Aberystwyth's Rheidol ward. The election has been called after Martin Shewring, a sitting town councillor, resigned from both the Lib Dems and the Council following an internal argument within his party. He's been strongly criticised for wasting council money (up to £1600 to hold the election) in resigning only ten months before the next full round of local elections in May 2012. Most people who leave their parties stay on under their new label until the next election. On the other hand, those councillors, AMs and MPs who've done exactly that are habitually told they should have put their new allegiance to their electorate. So it could be argued that he's acted with integrity. Rheidol ward was a safe Lib Dem ward for many years until Aled Davies caused the biggest shock for some time in Aberystwyth politics by winning a County Council by-election there for Plaid Cymru in June 2008. The election will be held on August 4th. Ceredigion Council’s controversial Feasibility Study into closing Bodlondeb Residential Home in Penparcau in favour of a new facility at Hafan y Waun has concluded that the idea is...wait for it....feasible. Well, what else did anyone expect from a Feasibility Study? However the study, published yesterday, seems to show that the cost of re-furbishing Bodlondeb and avoiding the closure would not be the £300,000 first talked about but, in fact, only £268,000 over many years. The cost in the first four years is put at total of £113,400, a relatively small amount in terms of the County Council’s budget. On the other hand a new facility at Hafan y Waun would apparently cost £74,000 less per year to maintain. The study concludes by saying that the move to Hafan y Waun, owned by Methodist Homes Association, is feasible but goes no further, simply recommending that the Cabinet gives this 'consideration'. The decision will therefore be a political one by members of the Council's Independent/Lib Dem/Labour Cabinet. Another packed meeting in Penparcau last night, organised by Ceredigion Against the Cuts, agreed to demonstrate outside the County Council Offices in Aberaeron on Tuesday morning when the Council’s Cabinet meeting will be discussing the report. The meeting begins at 10am. The feasibility study can be seen via this link. In the list of agenda items, click on Adroddiadau Adrannol Gwasanaethau Cymdeithasol or Social Services Departmental Reports (depending on language) and go to page 80. Ceredigion Council looks set to open up its meetings to film and sound recording, following a discussion by the full Council yesterday. The issue was discussed in the light of the incident in Carmarthen on June 6th in which someone filming a meeting on their mobile from the public gallery of Carmarthenshire Council was led away in handcuffs and put in a police cell (see story three posts down, with links). Since then, a Wales-wide campaign to open up council meetings to recording has taken off, recognising that both the Assembly and Westminster governments allow this and the technology that the average person in the street possesses has now moved ahead of council policy and practice. The clear consensus of the Ceredigion meeting was that the Council should open up, although within the consensus there were different views. Most supported the Council arranging for the filming of meetings and making that available to the public. But many strongly opposed allowing ad hoc recording on mobile phones, believing this could be made to show a distorted picture by editing. My feeling is that this fails to understand that anything publically available can be copied and edited in any case. There would be little point in the Council bothering to prevent mobile phone filming and the easy availability of a better quality version would make it less likely anyway. The possession by the Council of an original version would act as a safeguard. There was a slight suspicion that the occasional press reporter might already have resorted to sound recordings themselves (citing accurate reporting of detailed speeches without apparently writing them down). I made the point that having a recording of meetings can actually help the Council in some circumstances (for example, legal challenges) and would be more likely to lead to accuracy of reporting. One councillor proposed consulting S4C on the best system to use, something that could perhaps open up a new avenue for them. At the end of the debate the Chief Executive agreed to put together a report on the options for the electronic recording of meetings for the Council to consider within a couple of months and some kind of provision looks certain to be set up. Talking to senior Ceredigion officers, it’s clear they would not have reacted in the draconian way that Carmarthenshire Council did in the first place. But it’s interesting how that over-reaction now looks likely to lead to positive change across Wales, with many other Councils and public bodies due to debate the issue in the next few weeks. WHATEVER HAPPENED TO THE LYKE WAKE WALK? LinksAir: North-South Air Link in Wales. . .